Exactly 41 years ago, the Supreme Court took a major step forward in the fight for women’s health. 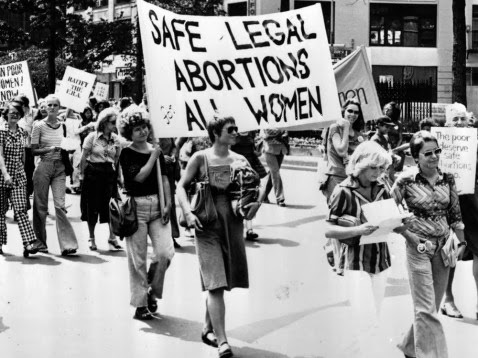 Roe v. Wade was decided in a world where illegal abortions were often incredibly dangerous, but the only option for many. Its impact of course reached far beyond the realm of constitutional analysis: in the real world, Roe brought increased access to safe and legal abortions, which is absolutely necessary to protect women’s health. Unfortunately, as we look across the nation today, we see numerous state laws threatening a woman’s access to safe and legal abortions. For example, TRAP (Targeted Regulation of Abortion Providers) laws single out abortion providers and clinics by imposing burdensome regulations, naturally barring access to safe and legal abortions in the 20 states where the laws stand. The Hyde Amendment, recently reinforced by the Affordable Care Act, limits federal insurance coverage for abortions and has led to many harmful state laws restricting not only public, but even private insurance coverage of abortion. These laws overwhelmingly impact low-income women, who do not have the funds or means to retrieve abortions with such barriers. Women’s rights advocates in the legislature and national and state organizations are uniting to bring back safe and legal abortions for all women. The Women’s Health Protection Act, federal legislation recently proposed by Senator Blumenthal, promotes women’s health by officially prohibiting laws, such as TRAP, that single out abortion services and subsequently bar women’s access to safe and legal abortions. The law prioritizes safety and health, and puts the choice of whether to terminate the pregnancy solely with the woman and her physician. As noted above, a woman’s choice in whether to terminate her pregnancy is frequently impacted by insurance restrictions. All* Above All is a national campaign taking a bold stand against the Hyde Amendment and similar restrictions to ensure access to safe and legal abortions for all women. Instead of accepting the status quo that federal funds cannot be used for abortion, these advocates are working with local organizations and individuals to fight existing barriers to insurance coverage. In Washington State specifically, Legal Voice and many of our partners are working tirelessly to pass the Reproductive Parity Act, which would ensure that all insurance plans that cover maternity care also provide abortion care, and a municipal resolution urging support for comprehensive abortion coverage through public and private insurance. Indeed, these initiatives are just a few of the many around the country united with a common hope that the potential of Roe will soon be realized—that all women, regardless of socioeconomic status or residence, will have access to safe and legal abortions. Neha Mehta is an intern at Legal Voice and a third-year student at Harvard Law School. As a California native, she looks forward to returning there upon graduation in May, and hopes to work for women’s rights throughout her career.